F for Food: Buck Jumping & Having Fun. Buck Jumping & Having Fun. Seven years ago at this time Katrina had just hit New Orleans and forever changed a lot of things for a lot of people. It was one of those landmark events in history that will always remind us of where we were and what we were doing when the hurricane roared through with its devastation. Not entirely unlike 9/11 in that sense. During Katrina, I was living in a different house with a different person. We were glued to the television all night in awe and shock stricken silence. I was, even then, up here in my canyon. Beso was there and so was Milo. I’m pretty sure around that time I was cooking things like braised short ribs, sausage and cheese grits, meatloaf, barbecued tri-tip, various types of fish with various types of salsas on top of them and mushroom risotto and stuff like that. Kitchen-wise, I guess things were not so terribly different than they are now. Though the music has decidedly shifted in the tune of my world, and the orchestra of my kitchen, and, I’ve certainly advanced a great deal. I still appreciate, and crave, my foundation dishes and my staples, as well. Heck, I make the fish/salsa thing all the time. Lately I’ve been fiddling a lot more with sauces and accents - chimichurris, preserved lemons, hot sauce, mignionettes, reductions, jus, roux and the Five Mother Sauces. I’ve also been deliriously happy playing with all the wild stuff growing in my garden - some of which I have never cooked with, or heard of. As a result of a vintage cookbook sale last Sunday at the farmers’ market, and the eve of Isaac hitting New Orleans on the almost-to-the-day anniversary of Katrina, I read through my two new/old Louisiana cookbooks and decided to try my hand at shrimp étouffée. That dish, of course, involves a roux. I think it turned out pretty well. Fred nearly ate his body weight in the stuff. I wasn’t the greatest judge as I’ve A) never made shrimp étouffée, or any Louisiana cuisine in my life and B) I’m, admittedly, not a huge fan of said cuisine. However, I enjoyed it. But something was missing. Some layer. Some complexity. I’m not sure what it was, but I look forward to playing a lot more with my new/old Louisiana cookbooks to figure it all out. So no, I will not be sharing with you my shrimp étouffée recipe. Seems almost blasphemous for me to do, really. But I will get back to you on it. Back to my garden. I have a small bush growing there, with little, lantern-like things dangling from the small branches. My mom planted this green baby a while back, and I remember she was really excited but wasn't really familiar with the plant. 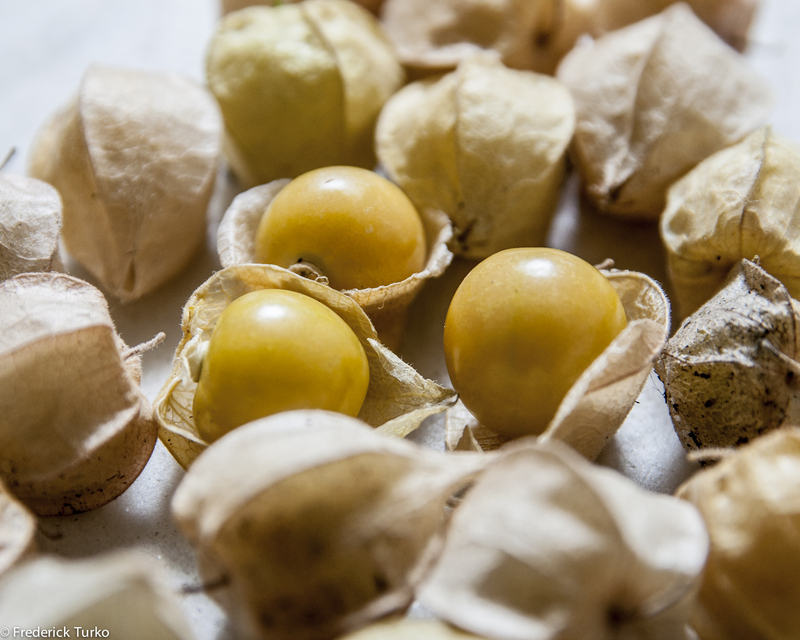 We thought, maybe, tomatillos? No. Well after some research on the interwebs I came to the conclusion that I have a Cape Gooseberry bush. You know the berries are ripe when they fall off the bush. When you peel back the little lantern a smooth, yellow berry is revealed. It is about the size of a marble, and resembles a miniature spherical tomato, about one or two centimeters in diameter. Like a tomato, it contains numerous small seeds. It’s sweet when ripe, with a mildly tart flavor - kind of like a raisin married to a tomato. I didn’t have enough to make a jam (nor would I ever want to), but that seemed to be the only application I could find. I did see a cape gooseberry and apple crumble. No thanks. And then I realized the gooseberries would probably make a beautiful reduction for duck or pork... or foie gras... sigh. And I just so happened to have a pork tenderloin in my fridge. Done and done. I make pork tenderloin all the time. I was making it seven years ago and even long before that. I sometimes stuff the tenderloin with garlic, spinach and goat cheese and serve it over purple mashed potatoes. Or sometimes I smother the pork in herbs de provence, sear the outside and then slow roast it. Recently I’ve been barbecuing it on the grill. I always serve pork tenderloin in medallions. 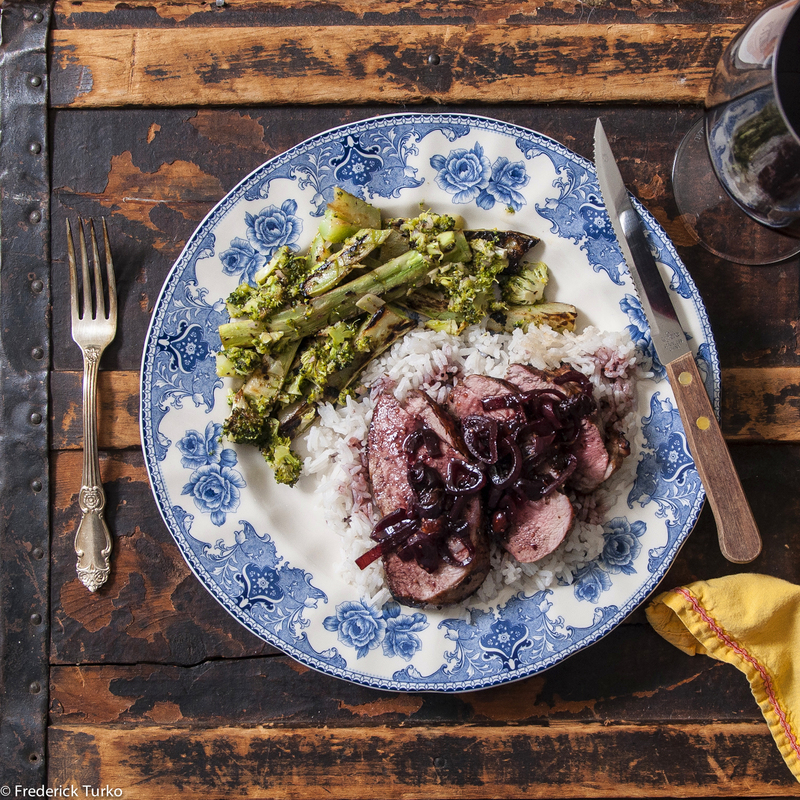 This time I marinated it in sweet tea for twenty-four hours - let’s just call that a brine - grilled and served it over rice, smothered in a cape gooseberry reduction with a wonderful broccoli preparation on the side. 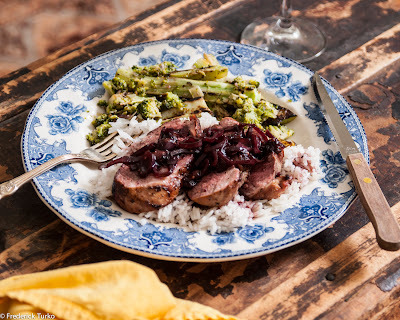 Fred, who historically, is not a fan of pork, upon eating this dish exclaimed that pork tenderloin may now just be his favorite meat. As I said, this dish is one I would have been preparing all those years ago, but the reduction is entirely me in 2012. As they say, accessories make the outfit. I’d even say that accessories turn an outfit into a look. And, in regards to the look, the sound, the music of my kitchen, to quote Farnand Point, "In the orchestra of a great kitchen, the sauce chef is a soloist." And with this meal, as we were finally able to confidently switch from watching the news to resuming our marathon of season two of Treme, we breathed a sigh of relief for New Orleans. They may have gotten bruised, but they ain’t broken. The second line buck jumps onward. To prepare the sauce, combine the port, balsamic vinegar, thyme, shallot and lemon zest in a medium sized saucepan. Set the pan over medium heat bring to a boil then reduce to low heat and simmer. Simmer until reduced by half. Strain the liquid using a fine mesh strainer. Save the shallots. Add butter and the berries to the hot liquid and stir to release juices in the sauce without killing the tender berries. Season to taste with salt and pepper, add shallots back in and reserve sauce for later. I just want to say that I'm a fan of your photos! Hello there, Poland!! Thank you so much! It looks delicious. How long does it take to prepare? That's a great question, and one I should have answered in the recipe! It takes about 30-45 minutes. Thanks for reading! 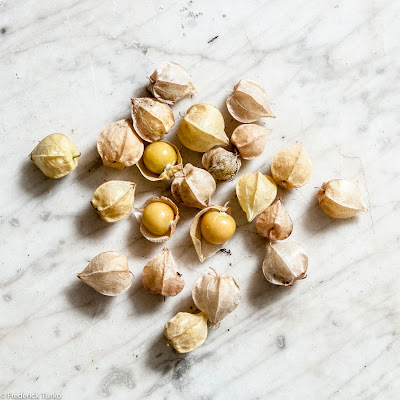 If you submitted your Cape Gooseberry Port Reduction Sauce photos to http://www.foodporn.net , I'll bet they will make you on the home page.